Odonus First Aid Thanks Mike D. I thank you for quick reply, I will wait it out and see what happens, this guy is quite the character):-) Thanks again<You're so very welcome. Sometimes it's very hard not sounding offensive, but many marine creatures are actually quite tough and built for a truly rough and tumble world. If left alone, many respond much better than with our good intentioned meddling and knowing when NOT to treat is often the first step towards success, contrary to what American pharmaceutical companies would like you to believe sometimes.> John. Clown Trigger With Ich (7-25-30 Hi my name is Paula <Cody here, sorry for the delay.>and I purchased a tiny clown trigger from the company I work for. I never acclimated it to the system when it came in at work. I brought it straight home and put it into a twenty gal. with 15 pounds of live rock and 2 maroon clowns the clowns do not bother it. I noticed the trigger clown had ich on it's fin before leaving work and was hoping that being in an established system the fish could recover on it's own. Before going any farther my ammonia is 0 ppm my nitrites are 0ppm and my nitrates are 10 ppm and salinity is 1.018. I purchased the fish Thurs. it's now Tues. (5 days) no better no worse eats great a little shy unless he's being fed but is doing well so far. My dilemma is do I wait or treat with CopperSafe now. I have a 75 gal. with a Foxface rabbit, regal and yellow tang, blue fin angel, yellow headed goby, bi-color and lawn mower blennies, snowflake moray which will eventually go in with the trigger, and a Percula clown with two cleaner shrimp and a fire shrimp. The only time I have ever had a problem with Ich is when I first brought the 75 gal. 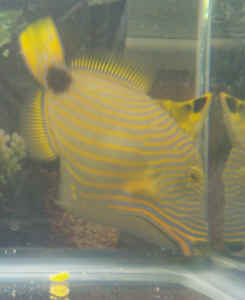 home stalked with 1/2 the fish in it now, bought from individual already set up. That was a chore in it's self I carried 60 gal. of water back with me and kept all rock submersed separate from fish. 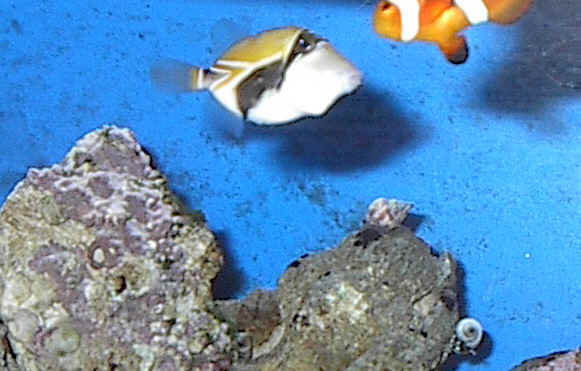 This is the last fish I am buying for a long time I have wanted a clown trigger for several years but knew it was not reef safe and it gets so large I wasn't ready to tackle that feet until my reef was complete. Anyway I haven't dealt with triggers much I know what they eat and what they are like but am concerned with how the clown trigger will react to the CopperSafe. Also I don't like using this with out knowing a little more about how to mix it, I have purchased a copper test kit but CopperSafe doesn't have the number amounts just teaspoon or what ever. What is the amount I should achieve and how long do I keep it their. I have read .35 and others .25 and others as high as .50 although I feel .50 is probably to hi what amount will actually kill the parasite after it falls of the fish? Or should I try something else? wait it out? Lower salinity How low is low enough? I thought 1.016 but I have read 1.010 is that to low? I have a 2 1/2 inch cleaner would a 2 inch or less Clown trigger kill him? I fear yes if not I will try the cleaner shrimp first?<The trigger would probably eat the cleaner. Just add copper until the correct level is reached, put about 15 drops in the tank, if you are using the 20 gal. Then add more drops as needed. I would shoot for copper levels around .2-.25. Also if you want to keep the LR live you will need to take it out before treating. It would be best to also have no substrate as it can absorb the copper. The rock will need to sit in a separate container for at least a month before it can be put back in with fish. It would be best to also have no substrate as it can absorb the copper. Also if you use copper I would keep the salinity up to normal levels.> What do I do??? Help!